Our village map is now available… as a tea towel! 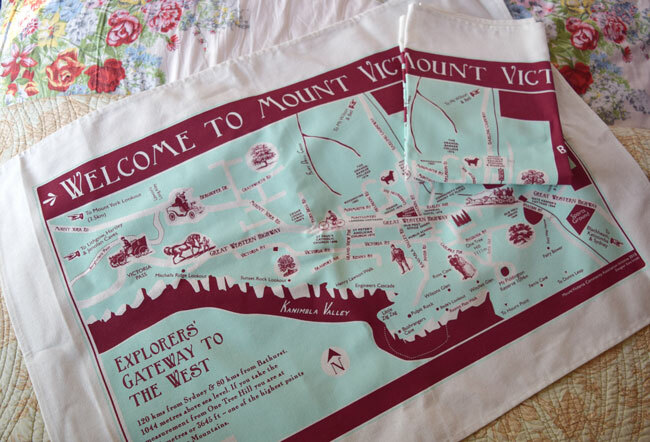 As part of the Blue Mountains Flexible Community Grant Program after the bushfires here in Mount Victoria in 2013, we now have beautiful linen/cotton tea towels available for purchase. All profits raised will go back into community development in Mt Victoria under our Association. These are a great little momento of your trip to Mount Victoria or send to someone special that loves our little village. Grab one from stores around in Mount Victoria or via paypal button to the right. Interested in selling tea towels? If you are a local business, you are welcome to enquire about wholesale prices for tea towels. We have a minimum order and will just require your abn number when sending invoice. Please contact Janene Theol, Secretary to find out more. Tea towels are $20 with postage price $2.50 across Australia. Alternatively you can pick up from our Secretary, Janene Theol. All profits go back into invigorating the community within Mount Victoria. Purchase your tea towel here and we’ll post to you – anywhere in Australia!